You might have read somewhere that Liverpool were pretty good in the 70s and 80s but how have Newcastle fared at Anfield since then compared to other teams? When you look at this table the only answer is, abysmally. When Liverpool were the very best then fair enough but Anfield seems to be a place where Newcastle are beaten before they even get on the pitch. In recent times clubs like Blackpool and Wigan have gone to Liverpool and played without fear, coming away with a win. Whereas even last season, despite Newcastle taking an early lead and the scousers having only won 3 of 9 home matches at that point, United just lay down and took the usual defeat. Old Trafford is the only ground where Newcastle have an even worse record and hopefully that 40 year curse will be lifted tonight. 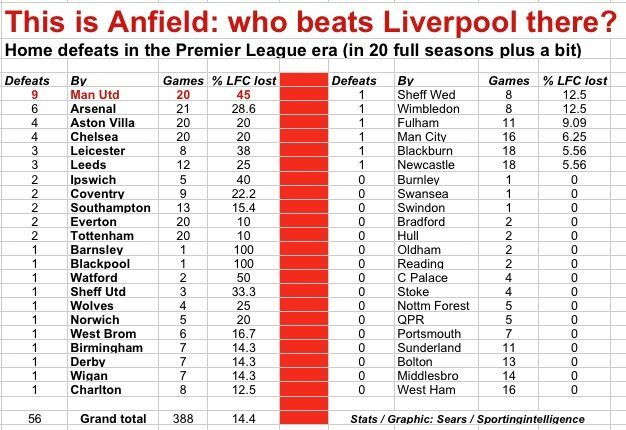 As for our red scouse affliction, when you look at the table (put together by the excellent Sportingintelligence website) you can understand clubs like Manchester United (there record now reads a very impressive 10 wins in 21 visits after last weekend’s match) and Arsenal having decent records at Anfield but Villa and Leicester! Certainly with the players we now have available, Newcastle should always be looking to put the other team on the back foot with players like Ben Arfa, Cisse and Ba. Attack is the best form of defence at places like Anfield and Old Trafford, after all what have we got to lose, with our record over the years it has to be worth trying something different. Going out on the pitch with a defensive mentality seems to breed a negative/losing mindset for our players over the years at places like Liverpool, telling our players to go out and have a go just might make it 2 wins in 19! Sign up to BetVictor and get up to a £25 free matched bet. Even if you only like an occasional flutter on the football the big attraction with BetVictor is that if you win, then on most occasions you’ll get paid more than any other bookie. For example, at the time of writing you could get 6-1 on Newcastle winning at Old Trafford with BetVictor, compared to 9-2 with Ladbrokes. If you fancy Newcastle to keep a third clean sheet in a row in a goalless draw and take the match into extra time, then 0-0 would pay 16-1 with BetVictor compared to 8-1 with Coral. Having a bet on Newcastle is a bit of fun but it will be a lot more fun if you bet and win with BetVictor!